Glomerulonephritis in dogs has been associated with B. burgdorferi infections. In Bernese Mountain Dogs with glomerulonephritis antibodies against B. burgdorferi have been found in most dogs, raising the question if the breed is predisposed to infections with B. burgdorferi. The aim of this study was to determine the prevalence of antibodies against B. burgdorferi sensu lato in a well defined population of Bernese Mountain Dogs and to compare this prevalence with data from dogs of other breeds. 160 Bernese Mountain Dogs and 62 control dogs (large breed dogs with long hair) were included. All dogs were considered healthy according to a questionnaire filled out by the owner, complete blood count, chemistry panel, urinalysis and urine culture. Bernese Mountain Dogs and control dogs were kept in similar environments. Seroprevalence of B. burgdorferi was assessed by ELISA and Western blot and was 58% in Bernese Mountain Dogs compared to 15% in control dogs. This difference was significant. Neither antibodies against leptospires nor vaccination or hair coat color influenced the results. The cause of the considerably higher prevalence of antibodies against B. burgdorferi in Bernese Mountain Dogs and it's consequences are not known. A breed predisposition can be suspected. Glomerulonephritis in dogs has been associated with B. burgdorferi infections [1–5] and in some studies spirochetes were detected in the kidneys [2, 3] and the urine . However some of the authors questioned the relationship of a renal lesion with B. burgdorferi [1, 3]; still others assumed B. burgdorferi to be the causative agent for renal lesions . In Bernese Mountain Dogs, a familial glomerulonephritis was reported [4, 5]. However, antibodies against B. burgdorferi were found in most dogs, raising the question of whether the occurrence of glomerular disease in Bernese Mountain Dogs is related to an infection with B. burgdorferi or if the breed is predisposed to infections with B. burgdorferi. The aim of this study was to determine the prevalence of antibodies against B. burgdorferi sensu lato in a well defined population of Bernese Mountain Dogs and to compare this prevalence with data from dogs of other breeds from a similar environment. One hundred and sixty Bernese Mountain Dogs and 62 control dogs were included in the study. Age, gender, hair coat color and breed are depicted in Table 1. Bernese Mountain Dogs were significantly younger than the control dogs (p = 0.01). Gender distribution was the same in both groups (p = 0.41). Fifty-six of the 62 control dogs belonged to 8 different long haired large breeds. The remaining 6 dogs were mixed-breed dogs with Collie, German Shepherd and Flat-Coated Retriever as dominant breeds. 1Significant difference between Bernese Mountain Dogs and control dogs (p = 0.01). The geographical distribution of the places where the dogs lived is depicted in (Figure 1). Map of Switzerland with the geographical distribution of tested dogs. Origin of Bernese Mountain Dogs (red dots) and control dogs (blue dots). The evaluation of the replies given to the questionnaires are depicted in Table 2. Analysis of the answers only revealed significant differences between the groups for the frequency of attached ticks. Significantly more Bernese Mountain Dog owners (44%) answered yes to the question whether the dogs often had attached ticks compared to owners of control dogs (25%; p = 0.01). The significance disappeared if only dark haired control dogs (n = 20) were compared with Bernese Mountain Dogs even though the percentage remained the same (25% and 44% respectively; p= 0.08). Do you perform tick prevention? Did your dog suffer from infectious diseases? The answers to the questions about the environment in which the dogs lived are depicted in Table 3. Significant differences were found between dogs which lived in a rural or a urban environment and for the percentage of time spent in the woods. A significantly larger number of Bernese Mountain Dogs (95%) lived in rural areas compared to control dogs (79%; p = 0.001). Looking at the two groups separately, living in rural areas did not lead to a higher prevalence in antibodies against B. burgdorferi compared to an urban environment. The reported percentage of time spent in the woods during walks was significantly higher in Bernese Mountain Dogs with antibodies against B. burgdorferi compared to those without them (p = 0.049). In control dogs no significant difference was found (p = 0.90). Did your dogs have access to the house or did he live only in a kennel? Had your dogs access to a run? Could your dog escape from the house or the run? How often did you walk the dog a day? 1Significant difference between Bernese Mountain Dogs and control dogs (p = 0.001). 2Bernese Mountain Dogs with antibodies against B. burgdorferi spent a significantly higher percentage of time in the woods on walks than those without (p = 0.049). In 160 Bernese Mountain Dogs and in 61 control dogs antibodies against B. burgdorferi were determined with both an ELISA and a Western blot. Of the Bernese Mountain Dogs, 92 (58%) had a positive ELISA with a positive Western blot, while in the control dogs this only happened in 9 (15%) dogs. This difference was significant (p < 0.001). In positive dogs ODs ranged from 0.21 to 2.00 (median 0.75) in negative dogs from 0.04 to 1.28 (median 0.18) (Figure 2). The ODs of positive Bernese Mountain Dogs were significantly higher than those of positive control dogs (p < 0.001). Seropositive dogs had 1 to 7 bands in the Western blot (median 4) while seronegative dogs had 0 to 3 bands (median 0) (Figure 3). The serology results are summarizes in Table 4. Control dogs with a dark coat had significantly more antibodies against B. burgdorferi (28%) when compared with control dogs with a fair coat (7%; p = 0.03). Bernese Mountain Dogs whose owners reported frequently attached ticks did not have antibodies against B. burgdorferi significantly more often (69%) compared to Bernese Mountain dogs whose owners reported infrequently attached ticks (55%; p = 0.07). Control dogs whose owners reported frequently attached ticks did not have antibodies against B. burgdorferi significantly more often than control dogs whose owners reported infrequently attached ticks (23% and 13% respectively; p = 0.30). 1Significant difference between Bernese Mountain Dogs and control dogs (p < 0.001). 2Significant difference between control dogs with fair and dark coat color (p < 0.03). Of 92 Bernese Mountain Dogs with antibodies against B. burgdorferi, 53 (58%) had antibodies against leptospires as well and of the 68 without antibodies against B. burgdorferi, 33 (49%) had antibodies against leptospires (p = 0.16). Of 9 control dogs with antibodies against B. burgdorferi there were 6 (67%) with antibodies against leptospires. and of 53 negative control dogs 28 (53%) had antibodies against leptospires (p = 0.35). Four Bernese Mountain dogs and 6 control dogs had been vaccinated against Lyme borreliosis. All 4 Bernese Mountain dogs had a positive ELISA but only 3 had a positive Western blot. Of the 6 control dogs, 3 had a positive ELISA and a positive Western blot and 3 were negative on both tests. The higher prevalence of antibodies against B. burgdorferi in Bernese Mountain Dogs indicates a breed predisposition. Susceptibility in some breeds to a certain infection is known from other diseases. For instance Rottweiler, American Pit Bull Terrier, Doberman Pinscher, Pomeranian, and German Sheperd Dog are breeds at significantly greater risk for parvovirus enteritis than mixed breed dogs . The reason is not known. However common ancestry has been associated with this. Intense breeding might have led to a decrease in defense against infections. This might also be true for Bernese Mountain Dogs, a breed that is known for intense breeding and that has a narrow gene pool. This is supported by the fact that several diseases are prevalent in Bernese Mountain Dogs such as bleeding tendency, epilepsy, and malignant histiocytosis [7–11]. However no infections have been described so far. In Cavalier King Charles Spaniels a breed that was known to be prone to Pneumocystis pneumonia infections, it was found that there was a immunoglobulin deficiency in the affected dogs indicating defect in immunity in these dogs . The findings in the present study are unique as infections with B. burgdorferi are not causing disease. Furthermore, no immunodeficiency is known in Bernese Mountain Dogs. At the time, B. burgdorferi was associated with glomerulonephritis in Bernese Mountain Dog, no direct relation to the disease could be made. It is possible that the Bernese Mountain Dogs with glomerulonephritis in this study had antibodies against B. burgdorferi because the over all prevalence of antibodies was so high in this breed . Labrador- and Golden Retrievers were found to be overrepresented in a group of dogs with distinctive renal lesions attributed to Lyme disease and also among seropositive dogs in a survey performed in Texas [1, 13], indicating some breed predilection for B. burgdorferi infections. However Bernese Mountain Dogs were not mentioned in the studies. It is well established that Borrelia organisms evade the immune system in different ways and host factors become more important the less pathogen the responsible organisms are [14, 15]. In human patients with Lyme disease-associated erythema migrans, the carriage rate of leukocyte class II alleles DRB1*0101 and DRB1*0101-DQB1*0501 was higher in patients with the least pathogen B. burgdorferi genotype . The immunologic event causing this association was not known but as DRB1 alleles are located close to certain major histocompatibility complex-encoded complement genes, it was speculated that variants of these complement genes might be in linkage disequilibrium with the DRB1 alleles [15, 16]. The innate immune response plays an important role in the early response of Borrelia  but it also plays a role in the development of certain glomerular diseases. Dogs with a genetically determined deficiency of complement C3 more often develop renal and infectious diseases . The occurrence of a complement disturbance would explain the co-occurrence of infection with B. burgdorferi and glomerular disease. However no such disturbance is known in Bernese Mountain Dogs so far. In one study 5% to 34% of the I. ricinus ticks in Switzerland were infected with B. burgdorferi and infected ticks were found in all areas where ticks were collected . These figures remained stable in later studies [20–25]. 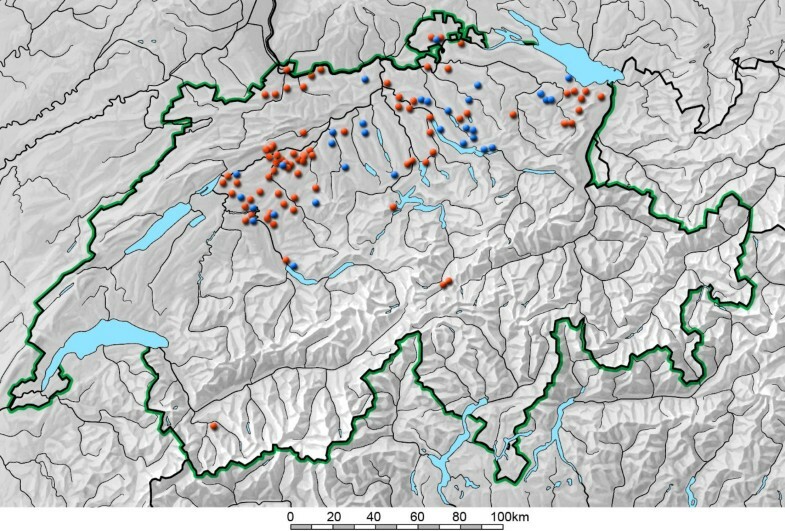 Even though owners of control dogs reported more often that they lived in urban areas, the Bernese Mountain Dogs and the control dogs in the present study were kept similar, lived in the same areas of Switzerland, were walked in the same frequency and for the equal amount of time in the woods. In addition all tick-infested areas in Switzerland harbor infected ticks. Based on this Bernese Mountain Dogs did not appear to have a higher risk of tick exposure compared to control dogs. Furthermore in a Dutch study, prevalence of antibodies were not different between dogs considered at high risk to a B. burgdorferi infection (hunting dogs) and those considered at low risk (pet dogs) . One explanation for this was that the rate of outdoor walking in house dogs was considered higher and this also applies to Bernese Mountain Dogs or other large breed dogs in Switzerland. Nevertheless Bernese Mountain Dog owners in this study reported that their dogs had attached ticks more often than owners of control dogs and it is known that seropositivity among dogs is positively associated with increased tick exposure . However the question whether the dogs had attached ticks more often was not specified and was therefore subject to the individual judgment of the owner. Furthermore neither the Bernese Mountain Dogs nor the control dogs which had a high frequency of attached ticks reported, had a significantly higher prevalence of antibodies against B. burgdorferi compared to those which did not frequently have ticks. A possible reason for the increased exposure of Bernese Mountain Dogs was the dark hair coat. In dark hair it is more difficult for the owner to detect ticks than in dogs with fair hair color. This would allow more time for the Borrelia species to move from the tick to the host and infect the dogs [28–30]. In the control dogs it could be shown that the ones with dark hair had significantly more often antibodies than those with fair hair (28% versus 7%). However, if dark haired control dogs were compared with Bernese Mountain Dogs, it could be seen that they also had significantly less often antibodies against B. burgdorferi compared to Bernese Mountain Dogs even though statistically significant differences in reported tick exposure disappeared. This indicates that hair color is not the explanation for the higher seroprevalence of antibodies against B. burgdorferi in Bernese Mountain Dogs. Furthermore it was found that people with white clothing attracted more ticks than people in dark clothing in the same environment over the same time period, indicating that fair hair might even attract more ticks than dark hair . Results of serologic tests are not consistent. The specificity of whole cell ELISAs is limited because of cross reactivity with other organisms . Even though Western blot was performed for the confirmation of the ELISA results antibodies of leptospires were measured to rule out cross reaction in the ELISA. Antibodies against leptospires are known to cross-react with antibodies against B. burgdorferi and it was found that antibodies against leptospires are common in healthy dogs in Switzerland [33, 34]. Results of the microscopic agglutination test (MAT) for antibodies against leptospires showed that there was no influence of leptospires on the results of antibody tests for B. burgdorferi. Vaccination can influence ELISA results . In Switzerland dogs are rarely vaccinated against B. burgdorferi and in the present study only 10 dogs were vaccinated, which did not seem to influence the study results. There are different ways in which Western blot results can be interpreted . In the present study criteria were used that were established in Europe because European B. burgdorferi strains are different from strains in the USA. Also the antibody response of European human patients with Lyme Borreliosis was found to be variable and more restricted than that in U.S. patients [37, 38]. Antibody response seemed stronger in seropositive Bernese Mountain Dogs compared to positive control dogs in this study as the reaction in the ELISA was stronger. Rather than differences in spirochete strains, in duration of the infection or in number of reinfections, differences in the immune response of the hosts are a possible explanation for this finding. In conclusion this study showed that Bernese Mountain Dogs more often had antibodies against B. burgdorferi compared to control dogs. Breed predisposition for antibodies against B. burgdorferi has not been reported before. More investigations are needed to evaluate the biological reasons and consequences of infections with B. burgdorferi in Bernese Mountain Dogs. The dogs whose owners belonged to the Club for Bernese Mountain Dogs in Switzerland were defined as the population to be examined. The number of dogs needed to predict the prevalence of antibodies in this population was calculated using the statistical software EpiInfo 6.1 (WHO, Genf, 1997). At least 131 Bernese Mountain Dogs were needed to predict an estimated prevalence of 10% with an accuracy of 5%. The prevalence of 10% was estimated according to prevalences found in the literature. The minimum number of control dogs needed was calculated using the software WinEpiscope 2.0 (Nacho de Blas, Zaragossa, Spain, available online). The control dogs were to be long haired, large breed dogs resembling the Bernese Mountain Dogs in size and hair coats. The hair coat color of the control dogs was classified either as dark (similar to Bernese Mountain Dogs) or as fair. Owners were contacted and volunteered to join the study after a call from the Swiss Club for Bernese Mountain Dogs and the Swiss Newfoundland and Landseer club. Others were directly contacted if it was known that they owned a dog eligible for the study. Samples were collected between July 2002 and April 2003. Dogs were included in the study if they were older than 4 months. The dogs were healthy according to the owners with no obvious signs of a specific disease evaluated by a complete blood count, a serum biochemical analysis and urinalysis. Serum biochemical analysis included determination of bilirubin, glucose, urea, creatinine, total protein, albumin, cholesterol, sodium, potassium, chloride, calcium and phosphorus concentrations and measurement of the activity of alkaline phosphatase, alanine transferase, aspartate transferase and amylase. Urinalysis included urine test strip (Combur-Test®, Roche Diagnostics GmbH, Mannheim Germany), microscopic examination of urine sediment and determination of urine specific gravity and urine protein:creatinine ratio. The geographical area of Switzerland where the dogs originated was not previously determined and depended on the place where owners who wanted to join the study lived. Each owner was asked to complete a questionnaire and give information about the health status of the dog (Table 2). One specific question was whether the dog often had attached ticks. However the category "often" was not further specified. The environment in which the dogs lived was investigated in retrospect by telephone interview (Table 3). An enzyme-linked immunosorbent assay (ELISA) for the detection of antibodies against B. burgdorferi sensu lato was performed in all dogs according to a method described earlier . Briefly a whole cell sonicate of B. burgdorferi sensu stricto reference strain B31 (ATCC 35210) was used as antigen. The samples were previously absorbed with a heterologous sorbant consisting of washed formalin inactivated whole cells of E. coli, Salmonella typhimurium, Brachispira hyodysenteriae, Bacillus subtilis and leptospires comprising 18 serovars. Western blot examinations for the detection of antibodies against B. burgdorferi were performed in all but one dog. A commercial test kit adapted for dogs was used (Virion Ltd., Rüschlikon, Switzerland). The tests which were performed according to the manufacturer's instructions consisted of Western blot strips with defined partial antigens of B. burgdorferi ss. and B. afzelii. In preliminary tests with positive and negative dog serum, a dilution of 1:200 and a conjugate (alkaline-phosphatase-rabbit-anti-dog IgG, H+L, Sigma, Diesenhofen, Switzerland) dilution of 1: 2000 was considered adequate. The interpretation of the Western blot results was done according to the interpretation criteria recommended for three European species of B. burgdorferi sensu lato . Samples were considered positive if bands at the level of the partial antigens p100, p58, OspC, p21 or wb18 were identified or if at least two bands at the level of the partial antigens p45, bmpa und wb30 were present. Bands at the level of the partial antigens OspB, OspA, OspD, wb22 und OspE were considered unspecific. For the microscopic agglutination test (MAT) to detect antibodies against leptospires, the ten most commonly recognized serovars (sv.) in Switzerland were used as antigens: Leptospira interrogans, sv. : australis, bratislava, autumnalis, bataviae, canicola, grippotyphosa, icterohaemorrhagiae and pomona; Leptospira borgpetersenii, sv. : hardjo and tarassovi. Data were recorded and analyzed using a commercial computer program (Statistical Package for the Social Sciences for Windows version 11, SPSS Inc., Chicago Il, USA). Between Bernese Mountain Dogs and control dogs variables were compared using the Mann-Whitney U test for the evaluation of age, optical density, percentage of time spent in the woods and a Fisher's exact test for all other data. Differences were considered significant at p < 0.05. BG: Designed the study, analyzed the data and drafted the manuscript. SE: Contributed to the study design, collected the data and contributed to the manuscript drafting and data interpretation. CER: Was involved in the study design and coordination and contributed to the critical evaluation and interpretation of the data.